Made from super-lovely Steamed Velvet, we can also make the dress in crushed velvet if preferred – see below for colour choices! The dress has a crossover neckline, is sleeveless, and has a fab faery-style bias cut skirt. It's worn in some of the pics with our Luthilaci Shrug! 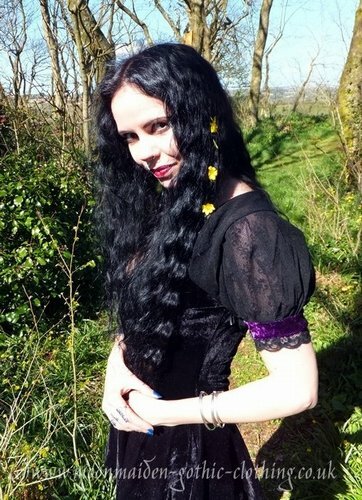 A great little dress for both everyday wear, AND faerygothing it up! UK Customers - Postage is included in the price shown. International Customers - Delivery is calculated and applied on the Cauldron page. Only 189 days 'til Halloween!